So, maybe you aren't into DIY, but I bet you've got a competitive streak a mile long...I certainly do! There's nothing like the sense of accomplishment you get from completing a task that you're generally supposed to "leave to the experts"! When it comes to vehicles? Absolutely, let us handle that! But today, we're going to give you a quick lesson in installing wall/window decals so that you feel prepared and confident installing them on your own after ordering from Car Wrap City. 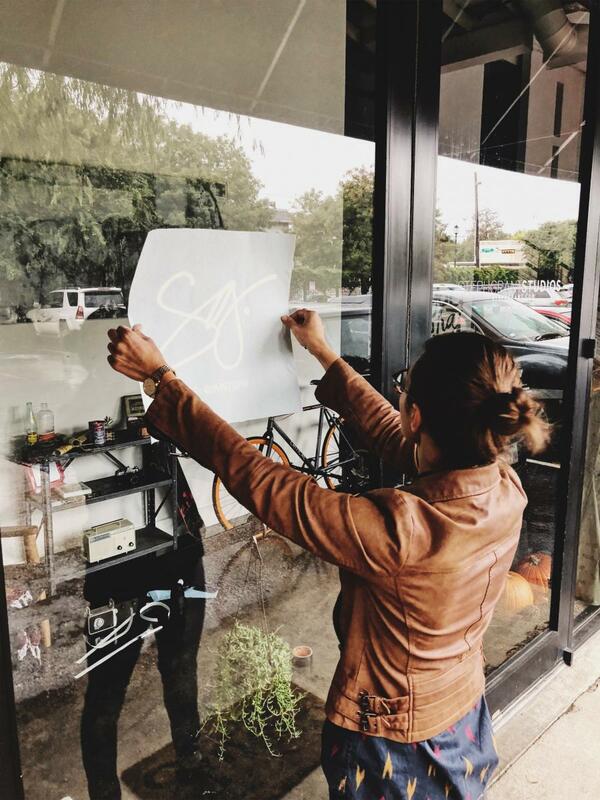 Here's an example of our team at Steph Grant Studios here in Dallas, TX, installing a door decal. Want to see the completed project in addition to an instructional video? Check it out here. Step one: Thoroughly wipe down the surfaces with alcohol or cleaner, using a lint-free cloth. Step two: Measure the length of your decal, subtract that number from the length of surface area you are adhering the decal to. Take that number and divide it by two, this will give you the distance you should alot for on both sides of your decal to ensure equal spacing. Step three: Using painter's or masking tape, gently tape down the sides of the decal so you can reposition if needed. Once you're happy with the placement, create a "hinge" down the center of the decal to hold it firmly in place. Step six: Holding the decal out, begin to squeegee from the center - out, in an up - down sequence, overlapping your last stroke to ensure there are no bubbles. Step seven: Now, remove your hinge and starting at the center again, pull your paper backing off to expose the other side of your decal. Align the decal with the tape marker on you surface and hold it out without tacking it back down. Step eight: Using medium pressure and starting at the center, squeegee out to the end of the right side of the decal in the same up - down motion as before. Step nine: Now that the entire decal is firmly adhered to your surface, carefully scrape the top right- hand corner with your knife to lift the transfer paper. Step ten: At a 40 or 180 degree angle, slowly remove the transfer paper completely to expose your decal! Simple as that, and you're done! Whether you need branding for your business, decor for your walls or a simple graphic on your vehicle, we want to enable you to get it done.